Warning: The Story arc from Action Comics No. 1-4 comes to a pause till Issue 7 in March. Issue 5 and 6 is an origin story by Morrison and Fisch and art by Andy Kubert, Brad Anderson and team. The story of Superman has been told and re-told so many times now that anyone who is not a Superman fan can tell you what it is. The moment you start reading issue 5, you realise that. But there are subtle changes. For example, we see Krytpo making an appearance in this issue. Krypto’s appearance feels planted. He gets sucked into the Phantom Zone while trying to save Jor-El from being grabbed by Krypton’s saddest and inhuman prisoners. I can safely assume that Krypto will make an appearance later on as the series progresses. When it does, it will be from this moment onwards. Superman’s origin story is clichéd. Let me be honest here. Unless you have something new to offer, don’t tell this story again and again. Morrison tells us this story with a twist. Lara is more involved in helping the young Kal-El escaping. The escape rocket is powered by a Brainiac operating system. As a young Kal-El departs, the planet Krypton is seen being destroyed. Art work is fantastic. Sharp features and landscapes is the norm. The expressions on the faces of the characters are really nice. 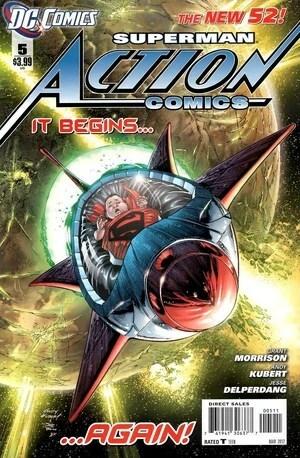 The details in the art work are particularly visible in the splash page where the rocket is in space and krypton is seen just before blowing up. My favourite panel is when Mr. Kent is seen repairing his truck on the road on a dark starry night and the rocket is seen entering earth. Later on the book progresses until at one point of time I completely lose the plot. What is that whole Anti-Superman Army?! I don’t get it. Maybe I will later on, but I just didn’t this time. I have one problem with this issue. During the flashback of Martha and Jonathan Kent not being able to have a baby, they go to church and tell their problem to the pastor. The Pastor says a line from the first book of Samuel, telling them the story of Hannah who ‘with God’s help bore Samuel, the greatest of the prophets’. What are the writers trying to suggest here? That Superman will be brought to them with God’s help? That if Martha and Jonathan pray enough they will bear a child who will be the greatest? If that is the case then I have a problem. It’s a bit extremist but in my opinion, that should have been completely avoided. It gives an impression that Superman’s upbringing would be religious and that he would be a Christian. I don’t have a problem with Christians, I have a problem with religion in comic books. Especially Super-hero comic books. They should NOT be portrayed as a Christian, hindu, Buddhist or anything for that matter. They should just remain super-heroes. That’s all. Overall, a strictly alright issue. Nothing great in the story apart from a few tweaks and changes. I’d give it 2.5/5.